Egyptian Prime Minister Mostafa Madbouly discussed on Tuesday with Apple CEO Tim Cook the opportunities for the giant tech company to make direct investments in Egypt, according to a statement by the Ministry of Investment and International Cooperation. 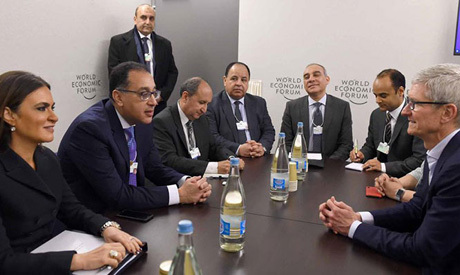 Mabouly and Cook met on the sidelines of the Davos World Economic Forum, where the CEO expressed Apple's interest in investing in Egypt, adding that the company is examining the map and possible areas of investment. Cook added that there are 38,000 people from Egypt working in IOS apps development. Cook also welcomed cooperation with Egypt in the field of education, saying that he looks forward to meeting with Egyptian officials and sharing with them Apple's experience and successes in the field around the world. Prime Minister Madbouly said that Egypt has a very ambitious plan to overhaul its education system, which includes providing 750,000 tablets yearly to high school students, explaining that Apple can benefit from this project by bidding to provide the tablets. Madbouly also said that the Egyptian government looks forward to having Apple invest directly in Egypt, highlighting the popularity of its products in the Egyptian market. The PM also said that the government had an ambitious plan supported by President Abdel-Fattah El-Sisi to turn Egypt into a hub for electronic industries in the Middle East. The Egyptian premier also highlighted that Apple can find investment opportunities in the New Administrative Capital, as well as in 14 other new cities being built across the country. Madbouly also invited Cook to visit Egypt. Last August, Apple became the first US Company to be valued at $1 trillion; however, the company lost that distinction soon after. The meeting was attended by Egypt’s investment and international cooperation minister, the finance minister, and the trade and industry minister, as well as Egypt’s permanent envoy to the UN in Geneva Alaa Youssef.